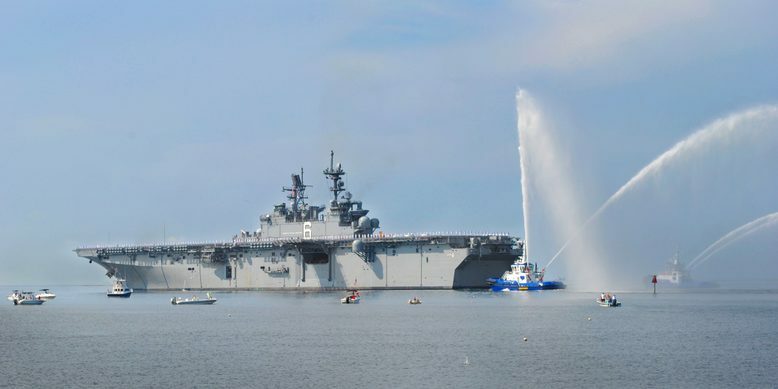 The USS America, due to be commissioned in October before arriving at its San Diego home port, has left Colombia, as part of her maiden voyage. The trip is billed by the Navy as “America Visits the Americas,” following the ship’s departure from its first home, Ingalls Shipbuilding in Pascagoula, Miss. The ship hosted a diplomatic reception before leaving Colombia July 19. Guests included Dr. Kevin Whitaker, U.S. Ambassador to Colombia, Gen. John F. Kelly, commander, U.S. Southern Command and Juan Carlos Pinzon Bueno, Colombia’s Minister of National Defense. America’s crew also offered humanitarian aid, delivering 52 pallets of medical supplies and toys to children with terminal illnesses in Cartegena. Project Handclasp is a Navy partnership with the private sector that sends goods donated for international distribution. ”Shipping this amount of cargo into Colombia would have cost a fortune for any charity organization. America on the other hand, did this at no extra cost to the taxpayer or to the volunteer organizations that provided the donations,” said Lt. Cmdr. Jonathon Cox, America’s assistant supply officer, in a news release. America will visit Brazil, Chile, Peru and Naval Station Guantanamo Bay in Cuba, and engage in similar diplomatic and community activities with local officials before being commissioned Oct. 11 in San Francisco. In the meantime, though, the amphibious assault ship will be part of military partnership to foster good relations in the Caribbean, and Central and South America. Amphibious assault ships are replacing a different segment of the vessels, called “Tarawa class.” Described by the Navy as a “big-deck” assault ship, America and others like her will be optimized for aviation, including support for aircraft such as the tilt-rotor MV-22 Osprey and F-35B Joint Strike Fighter.